When I was younger I was exposed to skydiving through YouTube. At the time, however, I thought it was mainly reserved for professionals who jumped into football stadiums. A few years back, I was going through a period of depression when I stumbled across Skydive Jersey. I decided to do a tandem. My tandem instructor saw my reaction—I was laughing, smiling and having a good time. Then in 2018 I went back for another skydive and saw the same tandem instructor. He remembered me and told me that “you like this way too much to be doing another tandem.” He sent me to Sky’s the Limit, a drop-zone where I could become a licensed skydiver, and I’ve been there ever since. Skydiving saved my life. I was going through some things at the time. Life was difficult and my usual resilience strategies—running, working out five days a week, weren’t providing the relief that I needed. I loved working out. But with my depression I started to hate it. It wasn’t fun anymore. Now skydiving is it. It’s part of me now. It’s my stress reliever and my therapy. I don’t mind talking about it as long as it’s going to help another person. Do I want it to take over my life? No, because I want family and kids, and I have other goals for my life. But even now, I really like how skydiving makes me feel. And I want to find a way to give back to people. I just got my license at the end of March 2018 at Sky’s the Limit. I got addicted right away and less than a year later I have my “C license” and my coach rating. My goal is to get my pro-rating; I also want to become an Accelerated Free-Fall (AFF) instructor. I used to be an EMT; I love helping people. I’m the type of guy who has that one drive. I stay focused. My goal is to get very good at relative work so I can teach others and give back. I’m currently jumping an Aerodyne container with a Zulu 132. I started out on a 290 during my AFF course. Towards the end I downsized to a 190. By the time I got my license I was jumping a 150. I ordered my rig from Aerodyne and they sent me a Zulu 152 to demo. I ended up ordering a Zulu 132 and I plan to be on that for awhile. 5) Have you had any cutaways? If so, how many? I just had a cutaway a month ago. This story is a little embarrassing. It was my first time demoing the Zulu 132. I was switching out parachutes on my rig. I had never put a rig together so I wanted to get it checked out by the senior packer or by a rigger. I asked them to check it out which they did. Everything looked good so I decided to test it out. After an uneventful free-fall, my canopy opened into line twists. After I kicked out of those I looked up and noticed something wasn’t right. I could see my pilot chute. This was definitely not good—my pilot chute normally trails my canopy. I had rigged my parachute completely backwards. I said to myself, ‘well, I’m not going to try to fly this thing backwards’ so I just chopped it. I landed safely under my reserve and now it’s a funny story. My home drop-zone is Sky’s The Limit (STL). I jump there in season and I also work at manifest. I started working there in March 2018 around the time that I finished the requirements for my “A” license. Manifest is basically a customer service position. I intake the tandem students, print out jump tickets for fun jumpers, schedule tandem students—all of the customer service functions of the drop-zone. In season, we are open every day except Tuesday. 8) What types of outdoor activities did you enjoy growing up? To be honest, my parents emigrated from Haiti in the late 70s and when they first came to the U.S. they weren’t about spending a lot of time in the outdoors. They were focused on working hard and saving money. I have some family in Haiti whom I’ve visited twice; the last time I was there was when I was 10. My parents grew up in a rural area. My father grew up five houses down from my mom. In Haiti, my mom came from a family of farmers. There’s a lot of outdoor work involved, but not for sport. I am the middle child. I have an older sister, a half sister and a younger sister. Growing up, we kids did a lot of things to stay active. My sisters are dancers and I played football and ran cross-country and track. I’m still a big runner. I used to run at least five miles every morning. I still run a lot but not as much as I used to. I also work out five days a week at the gym. 9) What does your family think of your decision to start skydiving? At the beginning, when I did my first tandem my family thought that I was crazy. When I started AFF they didn’t even know. I told them I was going to the drop-zone ‘just to look.’ They knew something was up though because every time I left the house I would give them a hug and a kiss and say ‘I love you’—and I usually don’t do that. Once they found out they were upset. But after they realized that skydiving was making me happy they came around. Not 100 percent happy, but not upset. My favorite part is the free fall. The best thing for me is being in the moment . Once you let go of the plane. I’ve started to like canopy piloting a lot more to but the best part is letting go of the plane and being in the zone. I like the helping part. That’s why I’m trying to progress a lot so I can help others. It means an opportunity to get to know other diverse skydivers. 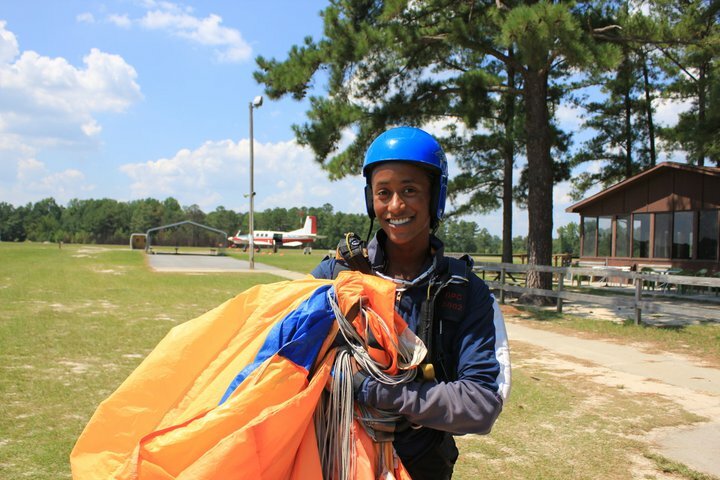 The big thing about the skydiving community in the U.S. is that it’s predominantly white. When I was at my drop-zone working on my skydiving license, someone mistook me for a tandem. I also overheard someone say that ‘this guy is probably not going to finish the program.’ Team Blackstar helps normalize the idea that there are Black skydivers. When I found Team Blackstar through social media, it really resonated with me that there were other skydivers who looked like me. 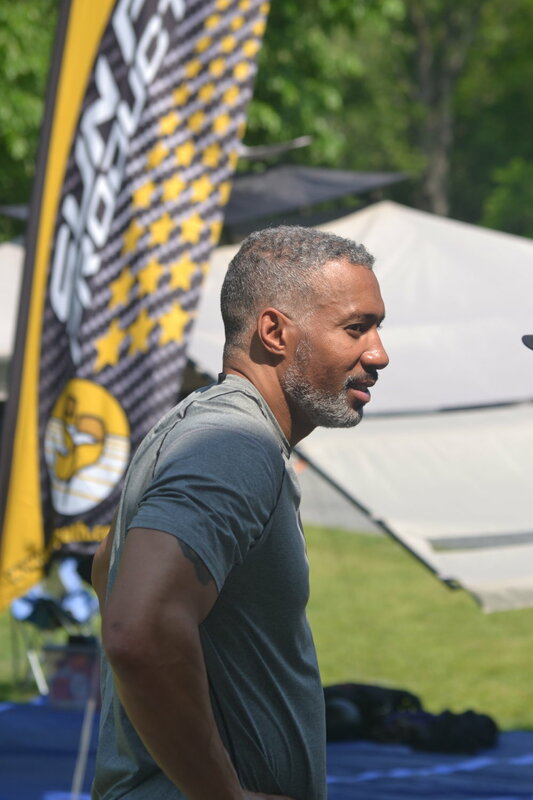 While I was working on my “A” license, I reached out and connected with more experienced jumpers in TBS like Brandon Johnson. He’s a skydiving instructor in Dubai. I got advice. I also met other jumpers in my area like Donte Caul. Team Blackstar is a great opportunity; you can find mentors, check on each other and keep each other going. 11) What is the most challenging thing you’ve ever done as a skydiver? AFF was definitely challenging. 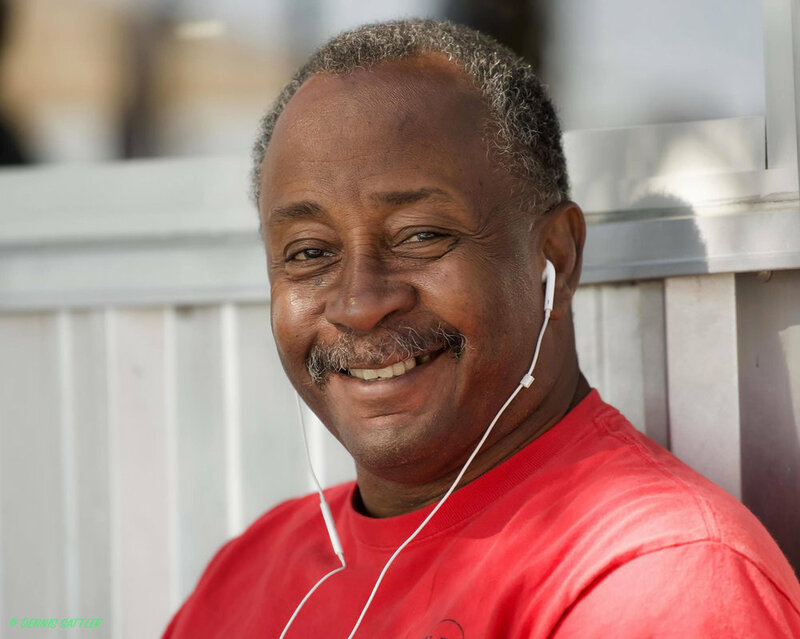 I had an injury: I ruptured my Achilles a year before I started the AFF program. As a result, I had difficulty straightening one of my legs. At the time, I didn’t think I would be able to finish AFF because of that. My instructors were trying to help me but they were also busy and didn’t really have the time to go in depth. 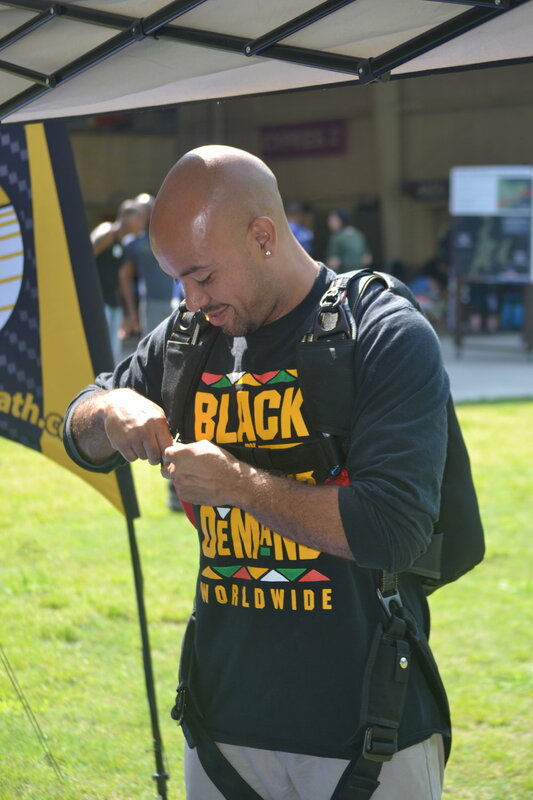 I reached out to Brandon Johnson—one of the first black skydivers I ever met—through Instagram and explained what was going on. He gave me some tips and I got through it. Aside from AFF, my most challenging moment was probably the completing the coach course. I felt like I was ready but I was still nervous. My examiner Melissa told me to put on booties. That was my first time wearing them and I didn’t know if they would help or make things worse. I jumped with the booties and did pretty well and I passed. Graduating the coach course was also my favorite moment in skydiving thus far. It puts me a little farther down the path towards my goal of becoming an AFF instructor and working with students.